In light of the news that new evidence suggests that Amelia Earhart might not have crashed into the Pacific at all, but crash-landed in the Marshall Islands and lived, Image Comics' 'Elsewhere' by Jay Faerber, Sumeyye Kesgin, and Ron Riley is as timely as ever. What if she and her navigator crash landed in a strange alien world instead? 'Elsewhere' is the fantasy series you didn't expect but is as fun and vibrant as they come. Amelia Earhart was a record-breaking American aviation pioneer and author. Earhart was the first female aviator to fly solo across the Atlantic Ocean. During an attempt to make a circumnavigational flight of the globe in 1937, Earhart disappeared over the central Pacific Ocean near Howland Island. Fascination with her life, career, and disappearance continues to this day. 'Elsewhere' is the perfect vehicle to imagine what ever became of her and navigator Fred Noonan in a colorful and entertaining new fantasy. Earhart is found hanging from a tree still attached to her parachute. Two recent escapees from Lord Kragen's fortress come across her and help her down. They explain they're part of the rebellion on the planet Korvath and are fighting Kragen's oppressive tyranny. She can't find Fred and the two, Cort and Tavel, decide to help her find him from the place they just escaped from. This sets them off on a risky rescue mission. Faerber's dialogue and characterizations make this a breezy and well-paced adventure. Cort's the congenial helpful one who's curious about Amelia and more willing to aid her. Tavel is more reluctant and worried about their own survival to be concerned with this odd stranger they just plucked from a tree. Amelia is surprisingly open to her new surroundings and adapting nicely to these furry samaritans. She doesn't seem phased at all about this new strange land even hopping aboard a winged beast she easily commandeers and befriends. Amelia is down for anything showing the kind of fearlessness and courage that made her a famous aviator. 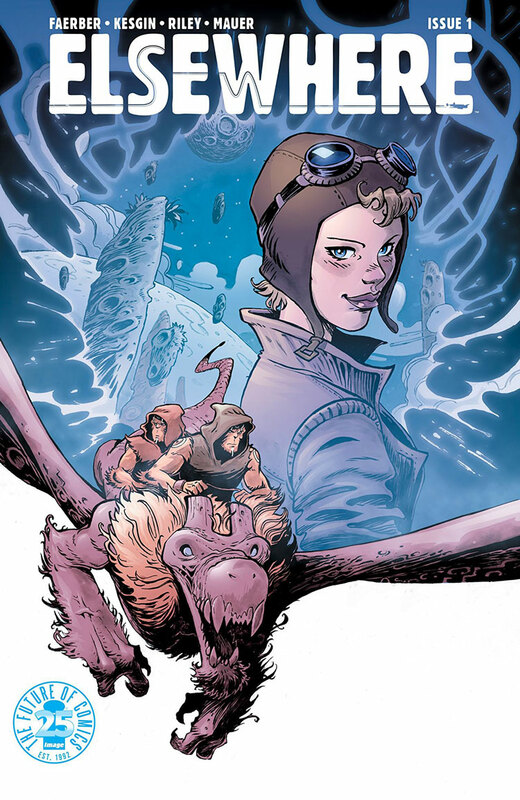 Faerber has made Amelia an easy protagonist to follow because as a reader you want to go where she goes drawing inspiration from her sense of curiosity and determination. Sumeyye Kesgin is a talented artist that shines in making a vast new alien world that is unique and seemingly ominous but vividly portrayed with Ron Riley's bold rich colors. Riley reteams with Faerber from their work on Copperhead, another sci-fi adventure that is also centered around a woman, and the result is luminous and inviting. 'Elsewhere' uses an alt-history premise to serve as a base to a wonderful space fantasy. You don't have to know about Earhart or another surprise guest to enjoy the story but it wouldn't hurt to get more informed either. This is an easily accessible story that is entertaining and looks fantastic. What more could you want in a comic?